WASHINGTON (CNS) — Women, especially among Christians around the world, generally are more devout than men when standard measures of religious commitment are considered, a Pew Research Center study found. Christian women are more likely to attend weekly religious services, be involved in daily prayer and consider religion important in their lives at higher rates than men, according to the study’s findings, released March 22. However, among Muslims, religious practice by men was significantly higher than by women when using the same standards, researchers discovered. The findings correspond to the cultural norm in most Islamic societies that Muslim men are expected to attend communal Friday midday prayer in the mosque. Women can fulfill the Friday prayer requirement individually, either inside or outside the mosque. The findings were are part of a comprehensive look at religious practices by gender among Christians, Muslims, Buddhists, Hindus, Jews and the religiously unaffiliated in 192 countries and territories. Overall, 83.4 percent of women around the world identify with a faith group while 79.9 percent of men do so. The study utilized census data, surveys and population registers from recent years in analyzing religious practices. “We did find that on many measures, particularly Christian women are more religiously committed than men,” Hackett told Catholic News Service. “But one of the interesting things, the same pattern does not hold among Muslims. There really is not a measure by which Muslim women are more religious than Muslim men,” he added. In the United States, women of all religions are more likely than men to say they pray daily (64 percent to 47 percent); attend religious services at least once a week (40 percent to 32 percent); and consider religion “very important” in their lives (60 percent to 47 percent). The study found that while the U.S. was more religious than some of the world’s most developed countries — specifically Canada, the United Kingdom, Germany, Australia and France — the gender gap between women and men in their religious commitment was larger than in those same countries. Hackett noted that while the study did not address why the U.S. was more religious than other developed countries, he said some sociologists point to countries — Western European nations in particular — where material needs of the poor, unemployed and elderly are met by government and that people in countries whose needs are not fully met may to turn to prayer or worship more frequently. The study cited the work of several sociologists who for decades have worked to explain gender differences in religious commitment. Theories include the “nature” factor, which attributes the differences to physical or physiological causes such as hormones, genetics or biological predisposition. Other studies point to “nurture,” in which factors such as socialization into traditional gender roles, lower rates of female workforce participation and national economic structures are seen as reasons for the higher religious commitment of women. Hackett said, however, that no one factor can be pinpointed to explain why women are more religious than men. Worldwide, the study found a mixed attendance pattern at worship services among the 81 countries analyzed. In 30 countries, mostly with Christian majorities or large Christian populations, women attended weekly services at higher levels than men. In 28 countries, most with large Muslim majorities or large Muslim populations, men attended weekly services at a higher rate. In the remaining 23 countries, there was no significant difference in attendance. The largest average gender gap existed among people who offer daily prayer. In 84 countries from which data were available, the average share of women who reported praying daily is 8 percentage points higher than the average share of men. Substantially more women than men said they pray daily in 43 of the countries. Only in Israel, where about 22 percent of adults identified as Orthodox Jews, did a higher percentage of men than women report praying daily. Men and women are equally likely to say they pray daily in the remaining countries. 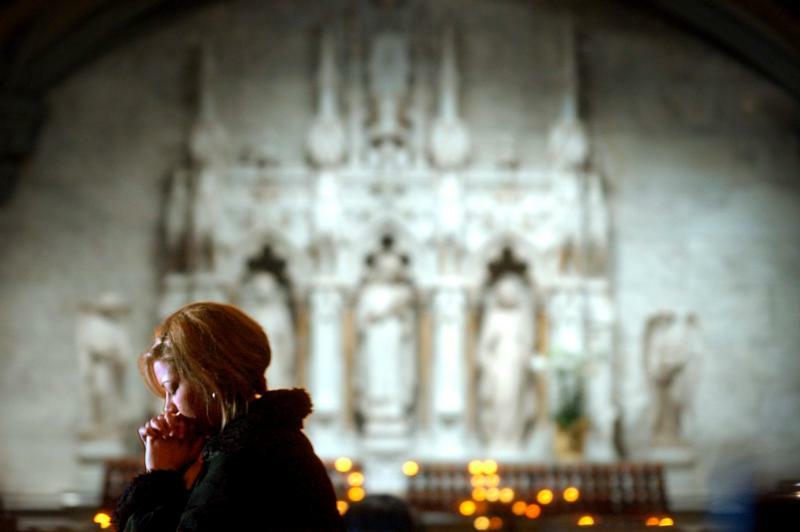 In nearly two-thirds of the 54 countries for which data on Christian prayer practices are available, a larger share of women than men reported praying daily, according to the study. Among Muslims, women and men pray about equally — 72 percent versus 71 percent — in 34 of the 40 countries in which data was available. Information about the importance of religion in daily life was available in 84 countries. In 36 countries, women were more likely to say religion was very important in their lives than men. Men responded at a higher rate than women about the importance of religion in their lives only in Israel and Mozambique. In the remaining 46 countries men and women responded at similar rates about the important role of religion. Among Christians in 24 of the 54 countries studied, religion was more important to women than men while the opposite was true in just one country: Liberia. In 29 of the countries, the gender gap was insignificant. The study also found that in 64 countries where survey data were available men and women were about equally likely to believe in heaven, hell and angels. In addition, men are more likely to be atheists than women, researchers found. In the U.S., 68 percent of atheists were men, second only to Uruguay where 69 percent of atheists were men.